When you talked about how to delete images from your iPhone you said something about an app called Image Capture (and mentioned that hardly anyone uses it). I must be one of those people as I’ve never touched it. What does it do? Although your scanner likely ships with some kind of software, you may not need it as Image Capture can take care of basic scanning chores. Connect a scanner to your Mac, fire up Image Capture, select the scanner in the Devices pane, and click the Show Details button at the bottom of the window to see just what Image Capture can do with your scans. You may be surprised by the number of options you find. Yes, Image Capture can capture images from your scanner. Normally, when you plug your camera or iOS device into your Mac, iPhoto launches. If you’d like a different app to launch—Adobe Lightroom, for example—you can make that happen in Image Capture. Just click on the small triangle at the bottom-left of the Image Capture window to expose the Application pop-up menu. Now select a connected device and, from that pop-up menu, choose Other. In the sheet that appears navigate to the app you’d like to open when you connect the selected device. Hidden in the depths of your Mac’s System folder is an app called AutoImporter (the path to it is /System/Library/Image Capture/Support/Image Capture). If you select a device and, from the Applications pop-up menu, choose AutoImporter, any time you insert that device, its images will be automatically imported into an AutoImport folder within your user folder’s Pictures folder. If you’re looking for an easy way to pull all the images off a camera or storage card, this is it. Select some images and, from the Import To pop-up menu, choose MakePDF. Click the Import button and a MakePDF app launches and creates a contact sheet from the selected images. You’re welcome to change the size of the thumbnails by selecting a different size from MakePDF’s Layout menu. When you save the file it will be saved as a PDF. Throw together a quick-and-dirty contact sheet with Image Capture. As you clicked on that pop-up menu you may have noticed a Build Web Page option. When you choose this option, select some images, and then click Import, the images will appear as thumbnails on a web page that opens in your Mac’s default browser. Click on an image and you’ll see a larger version of it. Click the larger image to return to the thumbnails page. Apple’s automation app, Automator, includes an Image Capture Plugin workflow. With it you can build a workflow that, for example, resizes your images and converts them to black and white. When you create and save one of these workflows it appears in the Import To pop-up menu. Select some images, choose the workflow, click Import, and the actions within your workflow will be executed. 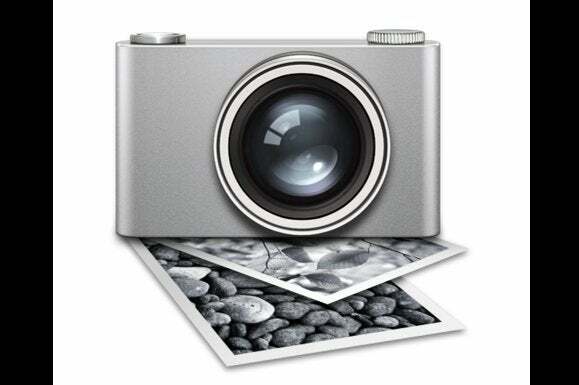 Automator and Image Capture provide a way to process images as you import them. In short, Image Capture packs a load of utility. If you haven’t taken time to explore it, you should.